If you’re someone who currently has acne, you may be experiencing dry skin caused by harsh acne treatments. Here is how to fix flaky, dry skin fast to get your skin back to being calm, clear and healthy-looking. How can I get rid of dry skin caused by harsh acne treatments? Immediately discontinue use of any topical treatments that contribute to your dryness and flakiness. This means you may to have to hit the pause button on your acne regimen until the skin gets repaired. But, don’t worry. The fact is, it’s hard to get acne under control when the skin’s barrier is compromised. It’s important to know that going easy on your skin will eventually lead you on a path to clearer skin. Stop or lessen the use of any exfoliating products. Facial scrubs, sonic cleansing brushes, and acid serums will damage your moisture barrier further and lead to continued dehydration and dryness when used too often—such as daily. Keep your skincare routine simple by only using a gentle cleanser and a calming moisturizer. Twice a day, morning and night, you’ll want to cleanse and immediately follow with the application of a moisturizer. If your skin is in an inflamed state due to harsh acne treatments, less is more right now. Avoid exposing your skin to direct sunlight. Since the skin is already irritated and inflamed due to drying acne products, you’ll want to stay out of the heat and sun which will only add to the sensitivity. Be sure to have a gentle, non-irritating sunscreen on your skin during daylight hours. What is a damaged moisture barrier? Invisible cracks in the skin that allow moisture to evaporate and irritants to get into the skin easier. Learn more about your skin’s moisture barrier. Benzoyl peroxide. This ingredient has been used for years to reduce P.acnes bacteria from inside the pores that can lead to acne. It can be effective for some people when used in moderation, but it is notorious for leaving you with dry, flaky skin. Retinoids. A vitamin A derivative available both by prescription and also in a lower strength sold at drugstores under the name Differin. While it doesn’t work for all types of acne (such as inflamed pustules or cysts), it can work well for closed comedones, non-inflamed bumps, and clogged pores. For the first two months or more, the side effects are dryness, redness, and peeling. With continued use, the dryness will subside. Read my beginner’s guide to using retinol and prescription retinoids. Topical prescription acne medications. There are many other cleansers, creams and gel treatments that a dermatologist will prescribe for lessening breakout activity, but most of them are meant to dry out the skin. A lot of times they will just leave with you dry, flaky and dehydrated skin. The key is to introduce them slowly and use them sparingly to avoid the backlash of dryness and peeling. Sulfate-based foaming face washes. Many acne cleansers are formulated with an ingredient called sodium lauryl sulfate. It’s an additive that causes a foaming action. Due to the lather it creates along with its high pH, it can be too stripping and drying for the skin. Instead, use a low-foaming, sulfate-free cleanser like Purifying Face Wash.
Over-exfoliating. With the popularity of products that contain acids like glycolic, lactic, malic and salicylic acids that instantly remove dead cells to promote clearer skin, many people love the result they give and use them daily. However, without realizing it, this can result in a damaged moisture barrier that causes dryness and irritation. I believe exfoliants should be limited to no more than five times a week but it will vary based on your skin type. Lack of using a moisturizer. Fear of a moisturizer causing more acne and clogging the pores? Many people who get breakouts will shy away from using moisturizer, even ones that are oil-free. Skin cells are like fish and need water to live so when it’s depleted, the skin is put in an unhealthy state that leads to tightness and severe dehydration. Add in the use of harsh acne treatments, and you really can mess up your skin. Using skincare products that sting. Some people associate products that sting with them “working.” A stinging sensation (especially from harsh chemicals) is not a good thing. Learn what it really means when your skincare products sting. Change in climate (like from fall to winter) or long airplane rides. Even if you’re not using harsh chemicals on your skin, the skin can still get dry and dehydrated from your environment. Learn the difference between dry and dehydrated skin. Before and after: How I fixed my 16-year old nephew’s dehydrated, flaky skin from harsh acne products. 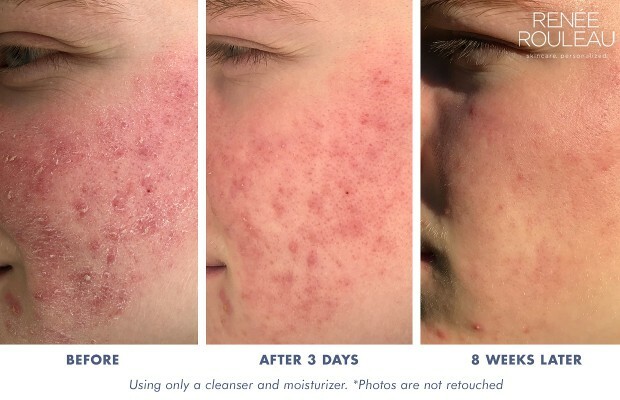 My nephew started breaking out when he was 15, so he started using a topical prescription from his dermatologist, along with washing his face with a harsh acne cleanser. His skin was getting really dry but he pushed through it thinking this was a normal side effect that needed to happen in an effort to control the acne. His face got extremely irritated and red and started to crack. I told him that I didn’t want to address the acne right now but instead, I needed to restore his skin back to a healthy place by repairing the moisture barrier. Once we got that repaired, then we could worry about the acne but for now, the priority was to make it skin less dry from the harsh chemicals he was using. He finally had enough and stopped using the prescription and went back to just washing his face twice a day. After a few weeks, his skin started to become a little better, but it still remained dry and flaky, as you can see in the first picture above. In the ‘before’ picture, this was four months AFTER he had stopped using the prescription medication. Shocking, right? The skin’s barrier was so badly damaged that it just couldn’t repair itself without some topical intervention of products meant to heal the skin. Enter his aunt, an esthetician! When I saw him this past June up in Cape Cod for a family reunion (which was when the first two pictures were taken), I immediately gave him a cleanser and a moisturizer to use that I happened to have in my travel bag. In just three days, as you can see in the photo, there was a significant improvement in reducing the dryness and irritation. When I returned back home to Austin, I sent him one additional product. A moisturizer called Phytolipid Comfort Creme. Since his skin was so badly damaged, I had him use a thicker cream one night a week in place of the Skin Recovery Lotion. After five uses, I had him go back to using Skin Recovery Lotion since that creme is not ideal for acne-prone skin. His dry, flaky, irritated skin was a sign of a damaged moisture barrier. When the skin’s barrier is compromised from harsh chemicals, it creates small, invisible cracks in the skin that allows moisture to evaporate and irritants to get into the skin easier. As for his acne, which I told him we would address once we got his skin back to a healthy place, there’s just not that much left. When the skin’s barrier is intact, it can properly defend microbial invasion and function in a healthier and proper way. Obviously, my nephew’s skin is an extreme case but it does drive home the point of how drying acne products can affect the skin’s appearance and overall health. 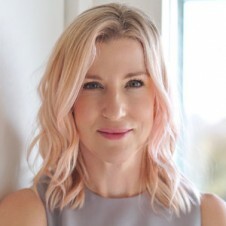 I hope this gives you some insight as to how to get rid of dry skin caused by harsh acne treatments so you can get rid of sensitive, flaky skin, once and for all. 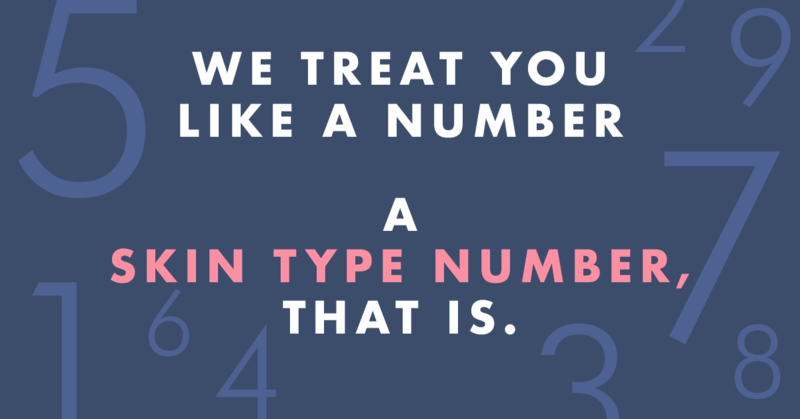 Of course, you’ll always want to choose products that are right for your skin type. This is a really informative post and I’m hoping you can help me to the same extent. I’ve been having a horrendous time with my skin, I’m pretty certain it’s because the barrier is damaged from use of a SLS cleanser a couple of years ago & probably made worse by what I’ve tried to do to fix it. Everything I put on my skin stings, burning sensation throughout the day & it looks red. I’ve tried desperately to help it heal, using gentle products etc but they all seem to sting & cause a reaction. I used Vanicream last week & woke up with bright red irritated skin. 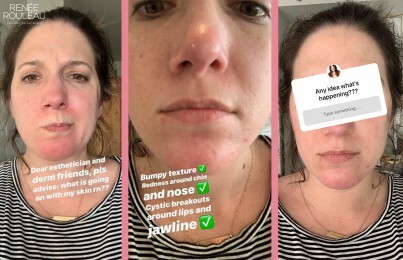 I’ve also tried Aveeno, Epaderm, E45, Avene Skin Recovery…everything flares it up. Hi Julia! 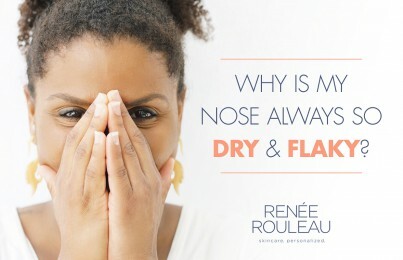 It definitely sounds like you have a damaged moisture barrier, I have a whole post about how to correct this: https://blog.reneerouleau.com/dry-tight-irritated-skin-your-moisture-barrier-might-be-damaged/. I think you’ll find a lot of useful information here. Hope this helps!